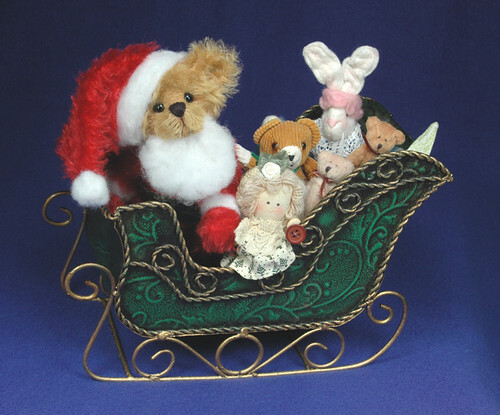 Santa Bear and his Sleigh - ADOPTED! Check it out, there's lots of great entries! On Sunday Lisa will be setting up an online voting booth so you can vote for your favorite entry. There are so many great entries, it will be hard! 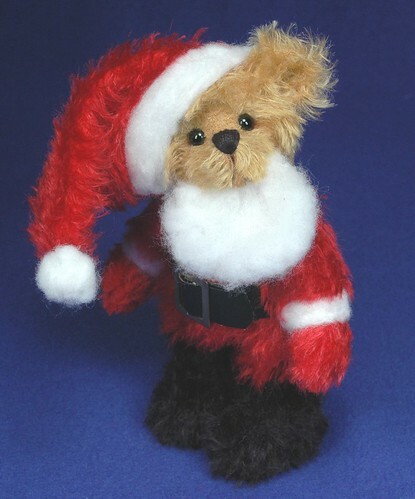 My Santa Bear is an 8" mohair bear. His outfit is actually mohair and part of his body construction - although his hat and belt ARE removable! (his belt is NOT mohair) His snowy white beard is actually needlefelted on with fiberfil. I used fiberfil as it is very hard to find real white wool! 1st Annual Softie Thanksgiving Day Parade starts Today! 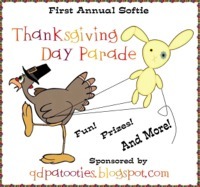 I'm currently in the middle of cleaning up what's left of the turkey and fixens... but realized I had forgotten to remind you about the 1st Annual Softies Thanksgiving Day Parade! Many artists have participated by creating their entries and emailing them to Lisa so that she can put the parade on. She'll even have voting set up on Sunday so you can vote for your favorite entry. Yes, I DO have an entry in the parade! Keep your eyes open! 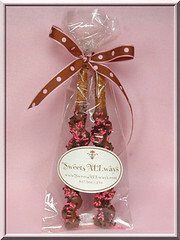 No, not bear related... but these were too yummy not to share! 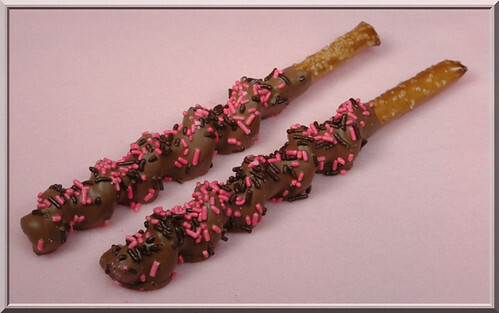 A friend of ours just started up a Sweets company and asked if I'd try taking a few photos. I love taking photos and her Sweets are works of art! I've been busy working on special order bears - but did get some time to put up another bear from my last show... Maxwell. 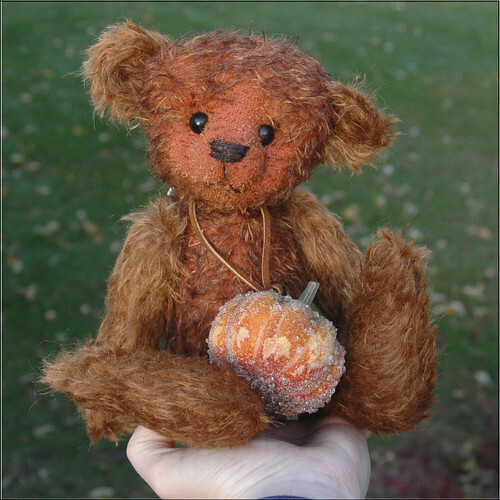 You can find Maxwell on my Bears 4 Adoption page. I have been absent from eBay for a long time while I was getting ready for shows. 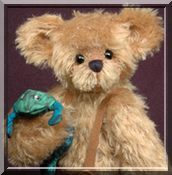 Oscar has made an appearance there - his auction ends on Thursday morning (Nov 15) a little after 8:30am "ebay time" Oscar's auction can be found here. I wanted to say a HUGE "Thank You!" to all of our Vets today... Veteran's Day! 3 Sneak Preview Bears! ALL ADOPTED! Here is a Sneak Preview of 3 bears before their official photo session tomorrow. They are of course available for adoption before they get to the website! You can click on their photos to see a bigger version. Oscar is a part of the "Olde Friends Collection". He is 11" tall and does not have pawpads. He is loosely jointed with discs and cotterpins... but not wobble jointed. Oscar was made from 2 kinds of mohair. His body and head are orange with black tips - in a sparse matted mohair. His arms and legs are sparse feathered brown mohair. He comes with a key 'round his neck and his favorite pumpkin. His adoption fee is $110 plus shipping. Lucy was made from the same pattern as the "Pleeease Mommy" Collection. She's 10" tall and has wired arms to hold her most favorite dolly. Her adoption fee is $135 plus shipping. Mickey is one of my "Patchwork Pocket Bears". 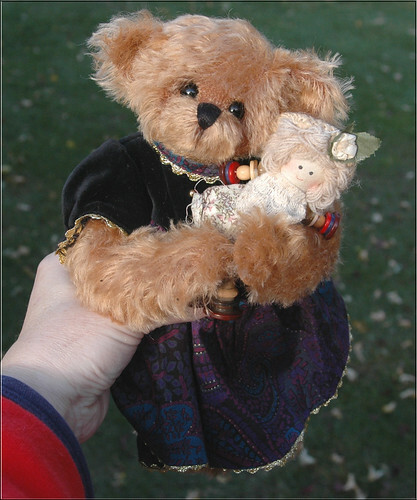 He is 6" tall and created from many different colors and types of mohair. His adoption fee is $65 plus shipping. 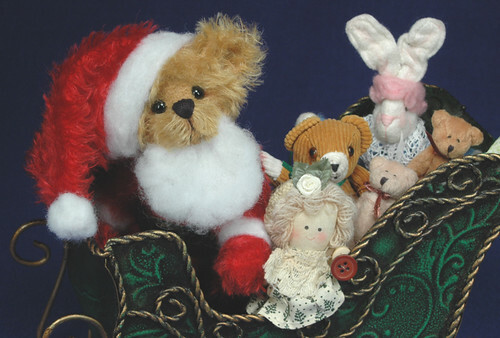 I can't help it, I am addicted to teddy bear magazines! I subscribe to the US magazines: Teddy Bear & Friends and Teddy Bear Review. I love seeing all the new bears every other month and reading about what is going on in the bear world. I mentioned last month that I was honored to be profiled in the British magazine Teddy Bear Club International. I have since subscribed :) I decided to go with both the actual mailed subscription and also the Imag. I wanted the Imag so I could have access to the past issues that are available. They go back to August of 2006. This morning I finally had a chance to browse a little bit thru a back issue or two! It was so cool. If you turn your speakers on, you will "hear" the page turning as you go to the next page. Too funny! Now yes, the print is a little small when you are on the main page setting of seeing the "open magazine", but just click your mouse on the page and it zooms you in for easy reading. I love my US magazines too! I have most of the back issues of TB&F and TBR from collecting the ones I was missing on eBay. I have a large stack of duplicate back issues too... why? So I can pass them out around town! You can't find teddy magazines on the newsstands anymore - not even in Barnes & Noble! I leave them around town in the hopes that one may find their way into the hands of someone who discovers that they love to collect artist teddy bears - they just needed someone to tell them about it! 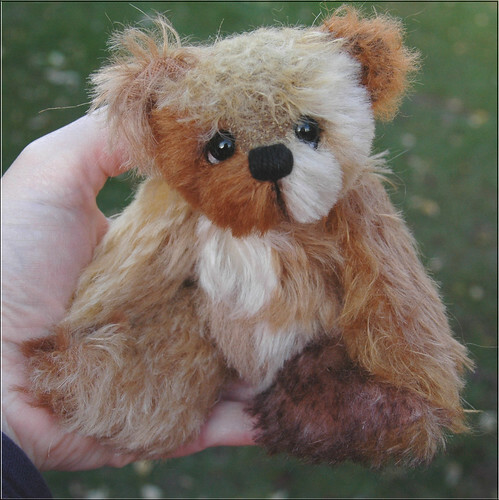 Jo Martenson of Bearfoot Alley Teddees has retired from bear making and teaching. It makes me a little sad because I won't see her as often at the shows and such. Jo was the one who got me started in bear making. She was so very generous with sharing anything you wanted to know! She had been doing it for 12 years I think - and has decided that it's time to try something new. Old Red is part of my new "Olde Friends Collection". 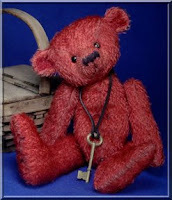 Although the majority of my bears have a definite "furry" look - I also love the look of the old bears. Making an "Olde Friend" is a lot of fun as it is such a different look for me! If you want to read more about Old Red, you will find him here or on either of the other links above too!. I know you haven't "seen" much of me lately. That is because I was doing very last minute prep and bear work for my last show of the year - the Schaumburg ABC OctoBear Faire. We three "girls" had a blast!! Friday morning we went to the Hobby Lobby near my house - it's only 2 miles away! Neither Daphne nor Lisa have one near their homes so it was a "must do"! For dinner, we were on our own - the Three Bearsketeers. Daphne and Lisa learned that we also have a Panera Bread nearby - and believe it or not, I've never eaten there! I'm glad they insisted - now I have a new favorite eatery! Friday night was the 25th Birthday Party Gala for the magazine Teddy Bear & Friends. This was the only time I took pictures and I promise to get them up soon! Mindy (editor of TB&F and ABC did a wonderful job! Everyone had a great time and there were awesome prizes to boot! The only problem with NOT staying at the hotel is Saturday morning. Show set up starts at 7am - early bird admission starts at 9. So you really need to get your table set up early - especially if you want a chance to walk around the showroom before the doors open! Needless to say, Daphne, Lisa and myself got a VERY early start on Saturday! The show was wonderful!!!! There was a fantastic selection of artists and bears to choose from. Yes, I got my bear for the weekend too! Collector traffic was steady all the way up to 1:30... then seemed to be just a 1/2 hour lull for lunch and it started back up again. Sunday traffic was noticeably less, but those who came were there to adopt new friends! Although finding new homes for my bears via the internet is "easier" - I just LOVE bear shows and can admit, I am addicted to them. There's just nothing like being together in a room full of other people who have the same love of collecting teddy bears. And you don't have to explain it to them LOL!! Saturday night, Daphne, Lisa & myself dined at The Cheesecake Factory. It's located inside the Woodfield Mall which is just minutes away from the hotel where the show is held. The food was wonderful and the portions were amazing! Believe it or not, this was also my first time eating here. It was a wonderful time of food (yep, more food!) and chat with bear people - and awesome time! Tami Eveslage organized the whole thing and did an awesome job! You can see some of the photos from that night here. Although I am sad that the show is over, I am excited to finally start doing some regular website updates soon!